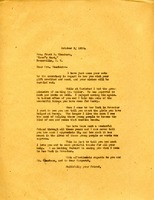 In this letter Martha Berry thanks Mrs. Chambers for everything that she has done over the years for the girls at the schools. She then tells her that she saw Mr. Waller at Carlsbad and told him of her help at the schools. Martha Berry finally says that she will see Mrs. Chambers in New York in November.